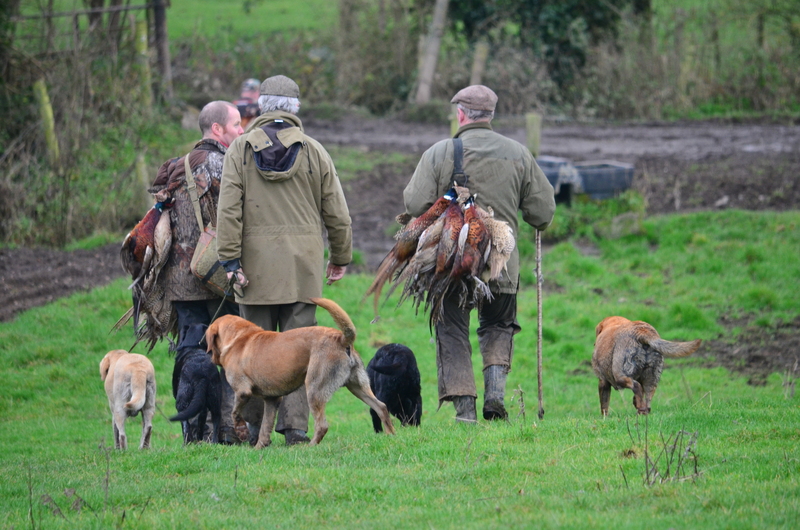 A brace of birds is usual payment for working your dogs on a shoot. 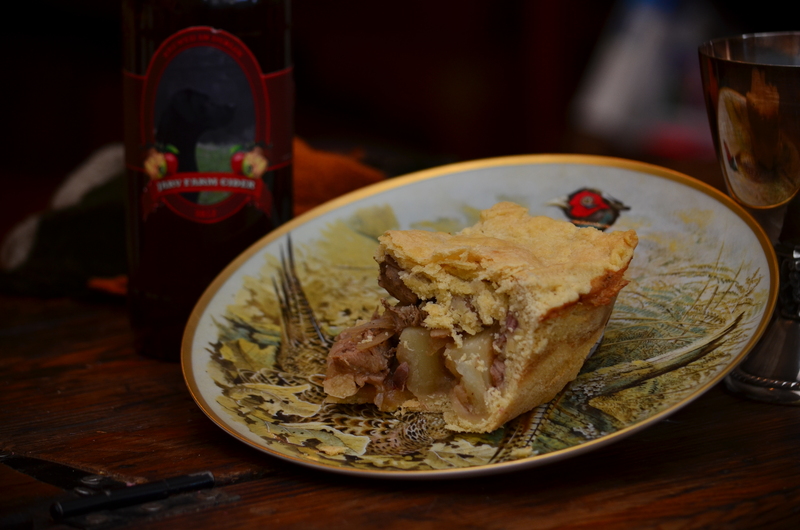 The brace of pheasant I used for this pie were birds I received as payment for working my dogs on a shoot last Friday. They had hung too long for me as roasting birds so I decided to use the breasts and legs to make a game Pie. After preparing the birds set them aside, turn the oven on to preheat and make the pastry. Regular shortcrust pastry is fine. I used 12 oz self-raising flour to 6 0z full fat butter. Set aside to rest in a cool place. Meanwhile chop an onion and at least 2 cloves of garlic. Peel and chop into fairly small pieces 2 potatoes. Remove the onion and add a carton of the small bacon pieces from Lidl. These are great as they come ready chopped, have plenty of rind and are slightly smoked. Shred the meat into smallish pieces and add it and the onion mix to the bacon pieces. Pour in a generous slug of Tawny Port and about 300mls of chicken or pheasant stock. Turn the heat down and allow the sauce to reduce slightly. Line a deep pie dish with some of the pastry and once the potatoes are ready add them to the meat mix and pour everything into the pastry lined pie dish. Cover with a lid of pastry, glaze with some melted butter and place in the pre-heated oven at 180 degrees celcius for about an hour. The true test of a great pie is will it hold shape the next day?? Remove from the oven and serve with a suitable French Red Wine. There will be quite an excess of juices left when serving hot straight from the oven. 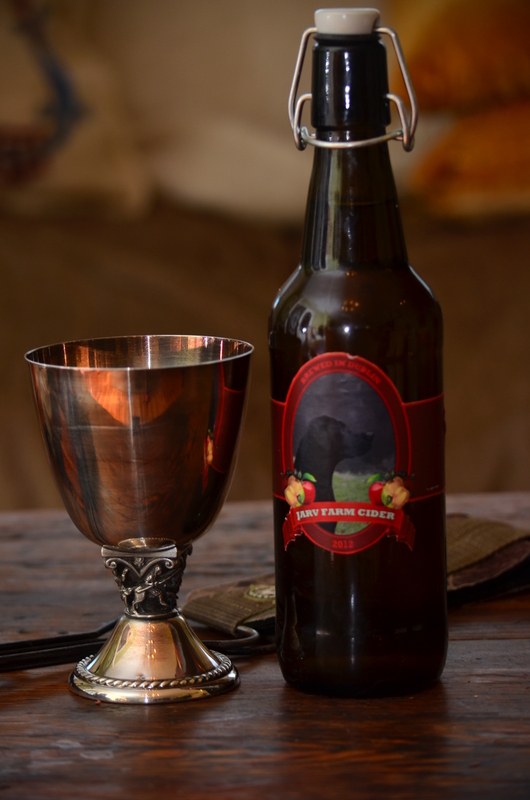 Of course the true test of a good Game pie is the following day when all of those excess juices have soaked into the pastry crust and the layers hold their shape when cut through….it did 🙂 and my recommendation for today’s cold pie is a deliciously cold bottle of Jarv’s homemade Apple Cider made using some of the apples from our own trees. Bliss…. This entry was tagged cookery, dogs, fishing, game cooking, hunting, recipes. Bookmark the permalink. ← When man created the Chessie …. French Wine ? French , I dont think so !!!! Not sorry to say I avoid all things French considering their attidude to us UK Farmers !